Up for consideration is a new pair of badges for the Neumann KM-8x Series microphones. This is an original Neumann replacement part for the KM83, KM84, KM85, KM86, and KM88 series mics, and they may also be the correct color/size badge for additional models as well. 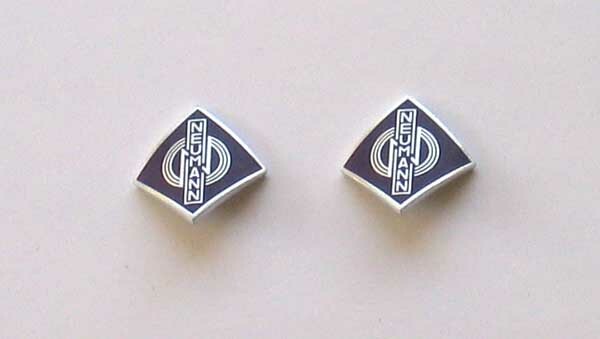 Since original Neumann badges are pretty rare, this may be just the thing for a Neumann mic restoration project, badge repair, or a direct replacement. 1270 hi-resolution photos of these badges are here. These badges are brand new. 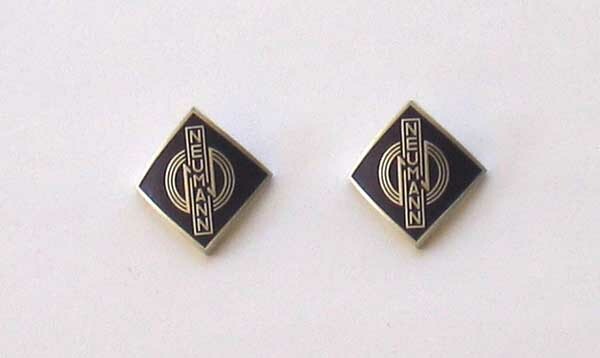 I bought them to restore several Neumann mics, and these 2 badges are my extras.  Industrial double sided adhesive tape is included for secure application. Simply apply the adhesive to the badge and align the holes to the protrusions on the back of the badge, and you mic will look as good as new!!! USA Priority Mail shipping is $5.00 with Signature Required, and I do accept PayPal. Thanks for looking. Please ask questions before bidding. Satisfaction Guaranteed -- 3-day return. 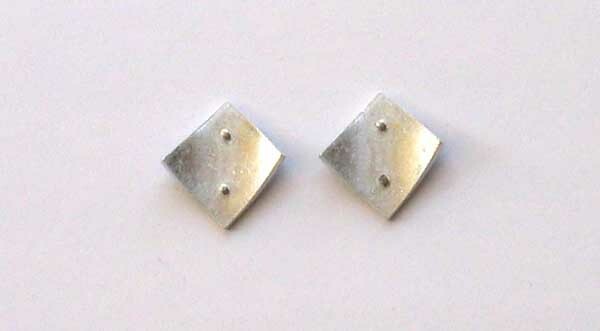 This auction is for one pair of Neumann Mic Badges for KM 8x Series Mics. Adhesive application tape is also included. Please note that these may or not fit on other models. PLEASE CHECK OUT my Schoeps Mic for sale in Current eBay Auctions, and also see some of my Neumann Mics that have Recently Sold on eBay.